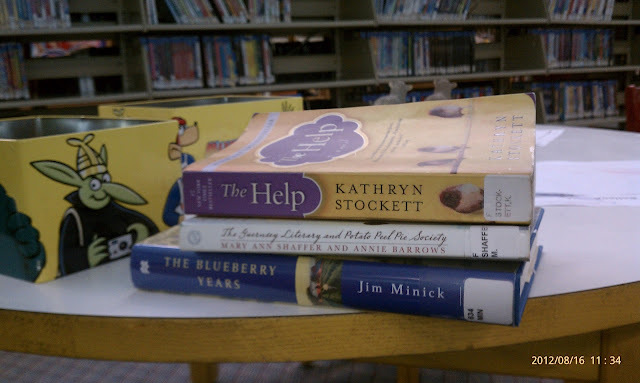 Last week I went to the library. And then I checked out 3 books. 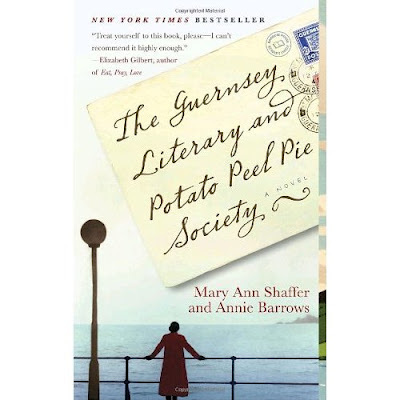 One of them was "The Guernsey Literary and Potato Peel Pie Society". Now this book I have been hearing about for a while now. However I never checked it out. "The name sounds intriguing" is as far I went. I have a difficult time when it comes to choosing a book at the library. Gone is the time when I would pick up any written word and read through it with baited breath. Gone are the days when many a summer afternoon in absence of anything worthy of reading, I would flip through the frail pages of the "Beni Madhab Sheel Ponjika" -- the Bengali almanac, its jacaranda cover fluttering helplessly like the fine petal of Nayantara, and read through muhurtams and lewd advertisements on the back cover without any idea of what they were trying to sell. Those were times when, if the librarian of our small town sent home a word about their newest consignment, I would rush to inhale the fragrance of fresh ink and paper without losing a minute. Now, not so much so. I just cannot read "any thing" these days. At least not on print. Anyway I read so much of "anything" and "nothing" on the web that when it comes to a book I want something which I can feel happy about later. Like a good biriyani. One that will not make me gulp down pepto-bismols in retrospect. So when I check out a book from the librray I want it to be something I look forward to going home to. Last month it was "Fried Green Tomatoes at the WhistleStop Cafe". I have not seen the movie and I don't review books but all I can say is I enjoyed reading it immensely. A couple of months before that was "A Tree Grows in Brooklyn", again another wonderful book(thanks I for reminding). Last week it was "The Guernsey...". And it is a book that not only makes me want to rush home, put up my feet and start reading (which does not happen everyday) but it scares me as to what will I do once the numbered pages are over. It is a book I want to go on forever. I don't know if it happens with you but it often happens to me. I panic about a book getting over, I panic hearing about an author slowing down and not writing enough. I still remember the immense sadness I felt when I had finished reading all of what Lila Majumdar had written and published. When the series "Ruku-Shuku" in Anandomela had winded down I had moped around for one whole month. When I closed shut "Gone With The Wind" I did not know what to do. "The guernsey..." seems to have that kind of an effect on me. I do not want it to get over and when I do finish the last few pages I am going to be a very unhappy soul. If I think of it deeply, it is a lot like a good biriyani or a heavenly egg roll or a bowl of Tom Yum soup. Now given that I have spent my free time reading, I did not cook a biriyani. 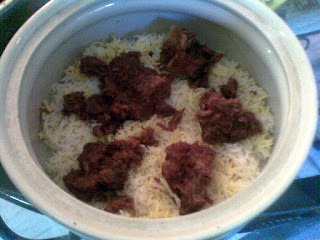 In fact I rarely ever cook a full fledged biriyani. Most of my biriyanis are short cut affairs. The husband man however cooks a mean Biriyani following a friend's recipe and the fact that the friend's recipes is of US fame makes sure that his is pretty good. However once, with a sidelong glance, I happened to see the ghee that he puts in that Biriyani.That made certain that I never dared to try my hand at it. That Mutton Biriyani we will talk about another day. 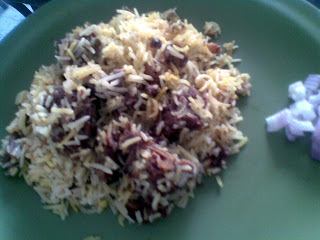 This Biriyani today is sent by a dear friend, a friend of long ago whom I lost touch with and then connected again over the blog. Strange Stories. Amazing facts. Now since I am a very nice person(ahem!) and only keep nicer company(amen to that), it was only natural that my friend took time from her busy life to not only cook a Biriyani but also take pictures and send it to me. I mean she sent the recipes and pics, not the biriyani, though the latter would have definitely been much welcomed. Over to her for the recipe as well as the pictures. I loved it how she split the work between two days and wrote the recipe accordingly, makes planning easy. I have no contribution to this recipe's deliciousness other than "cut and paste". Also she cooked this dish at her home in India so the microwave settings etc. might differ from other region. Wash mutton pieces carefully with hot water to remove skin and hair. Marinate with half of the curd and keep in refrigerator (not freezer) overnight. Should be taken out well ahead of cooking and be in room temperature while cooking. Heat ghee in a non-sticky wok or pressure pan. Put shah jeera as phoron. Add onion and fry in high heat stirring constantly to nicely golden brown, take care they do not get burnt. Add red chili and garlic. Saute till fragrant. Add ginger and saute. Add coriander powder. (May sprinkle a little water if required). Stir and then add mutton. 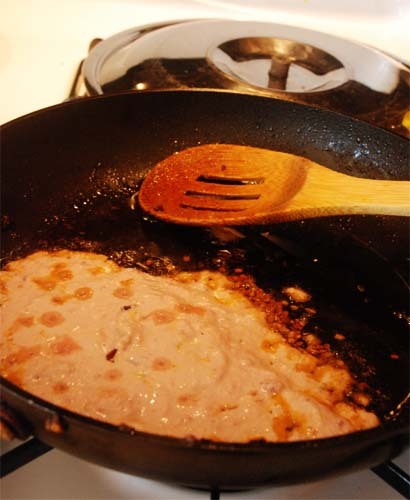 Saute well till muttons are brown and oil separates (do not overcook as they may dry up – its better to use a lid while kashano). Add the salt towards the end of kashano. Add the curd and saute well. Add sufficient water. Boil and pressure cook for 15-20 mins in low flame. Open the lid when pressure drops and boil to evaporate any residual water (there shouldn’t be any residual water at all or the biriyani will get messy). Wash the rice very clean and put them in a strainer, for 30 mins. Boil sufficient water in a deep container with lid. Add salt. Add the spices (can make a bouquet garni if possible, if not, use a slotted spoon while removing) and boil in the water (covered) in low flame till the colour of the water turns light brown. Remove the spices. Pour washed and strained rice into the boiling water and stir immediately once. Boil for 11-12 mins approx (rice breaks but not fully done when checking) in the open container. Close the lid and drain the water carefully, very fast. Drain till the last drop possible. (Best way is to hold the container with two cotton-gloved hands over the support of the faucet). Shake the container, tuck the lid and spread the rice immediately on flat trays. You may cover the rice with a net and put under a fan to cool. The rice should not bend or break in the whole process and get completely cool. Heat milk in a microwave oven and add saffron. Boil in micro high for 15 sec. Mix with the colour. Sprinkle the milk on the rice unevenly. Take a sufficient sized ceramic microwavable bowl. Place 1/4 of rice. 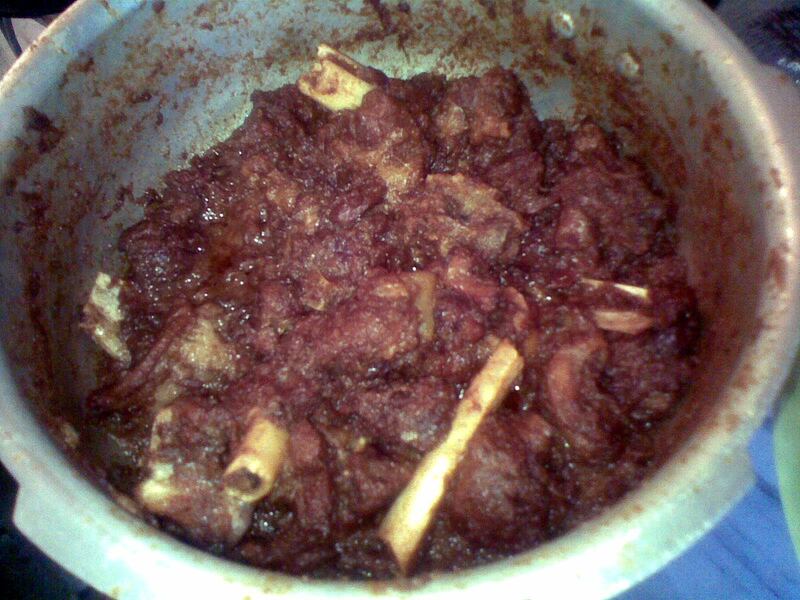 Arrange 1/4 mutton with gravy. Place next layers the same way. Final layer should be only mutton. Spread the remaining gravy with ghee (from the pan) on all the sides. Mix kewra water and scent. Sprinkle on whole top of the bowl. Close the lid to lock the aroma - seal with flatten wheat dough like a ribbon. Put the bowl in micro 10% (not more) for 70 mins till the seal becomes hard. Break the seal. Mix up once and serve immediately. Enjoy. August is a confusing month. It is still summer but there is a faint hint of Fall in the air. You can feel that invisible tug in your heart, the one that whispers about colder days and bare trees. When the alarm rings 5:30 in the morning, it is now dark outside and the dull yellow of the street lights seem kind of tired waiting for the sun to rise.The early sunrise and eager chirping of the birds are missing.I shush the alarm and snuggle into the quilted comforter. Early morning when I juggle a coffee mug, a juice jar and umpteen bags, trying my best to slide into my car with minimum drama, I see fine drops of water droplets on the windshield. My heart skips a bit and the juice spills over. The kids still play outside and draw on the sidewalk or ride their bike but the sun seems to plunge down early and by 8 in the evening big blobs of darkness has fallen around us. It is night, already, we ask ? Even a few days back we went for twilight icecream at 8:30. You feel the days getting shorter. And yet you feel happy, lucky to cherish the warmth and the luxury of the remaining summer days. August is also a special month for us, a year older, a year together, lessons learned, tears forgotten. For her birthday in August, LS did not want a party this year. Instead she wanted to spend it in a park and if it is an amusement park with rides that soar high she did not even want a present. So off we went to one such park that also had a chocolate factory next door, a 3 hour drive away to spend 3 days riding high and having fun. I mean I didn't. I mean I had fun but thank you no rides for me. LS had too much fun riding everything permissible with BS and BS's best friend who had come along with us. It was much fun to see the three girls together and though I spent 99% of the time just watching, I must say I had a good time. Back home we are now getting ready for the new school year. Folders, Binders, notebooks, sharpened pencils are being bought. School is still 3 weeks away but I guess we are kind of ready for it. As much as we will miss summer, there are lot of things to look forward to. And to pep up the feeling there can be nothing better than a warm oven and a home that smells of sweet vanilla and spicy cinnamon. 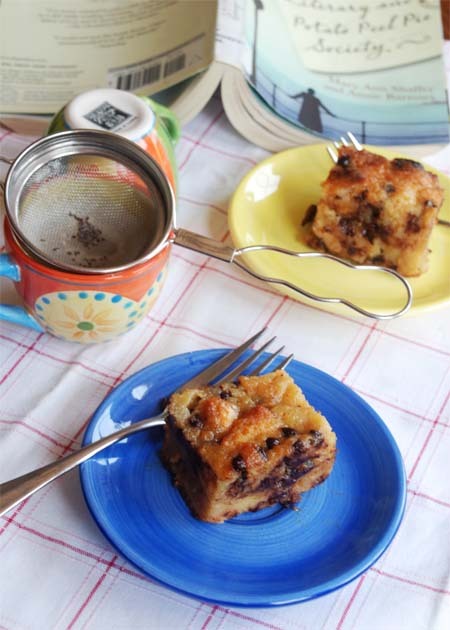 So the husband man baked a bread pudding, a rich, delicious affair. The trusted recipe was from T, the one of the Tiramisu fame. 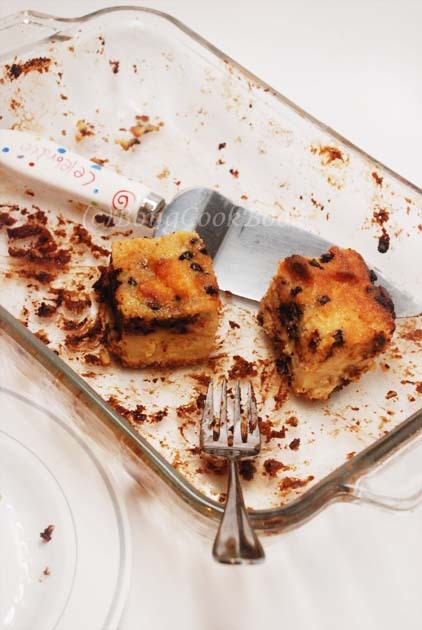 This bread pudding was exotic, at least it was very different from the bread pudding my Ma used to make very often. This one was rich, dense, gooey with all that chocolate and soft soaking in a sauce made with Irish Cream liqueur. It was PURE BLISS and I don't even like throwing my uppercases around. 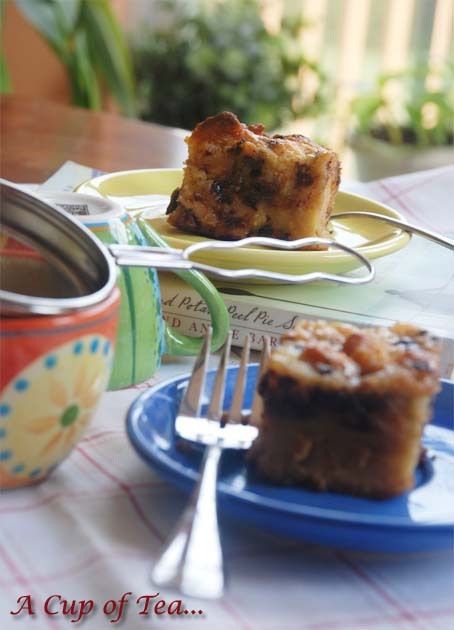 If you are like me and lamenting the loss of summer, you should totally make this bread pudding. It will make you so happy that you will start craving snow and thick fleece blankets. Maybe it is the liqueur doing the talking but you will never know unless you crank up the oven and tear up that bread. The recipe here is in T's exact words, so the "I" is actually "T". She wrote it in first person. Get it ? The husband-man followed the recipe like a Bible.Okay, that might not amount to much. What I want to say is,He followed the recipe exactly as written.And you better do that too. Preheat oven to 350°F. Spray 13x9x2-inch glass baking dish with nonstick spray. Transfer bread mixture to prepared dish, spreading evenly. Drizzle with remaining 1/2 cup cream. 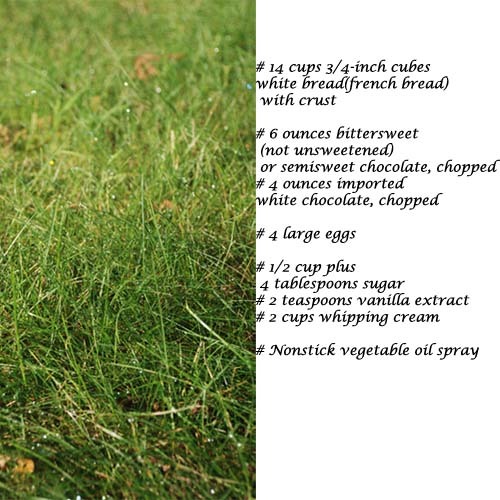 (I didn't do this, I felt it was sweet enough ->) Sprinkle with remaining 2 tablespoons sugar. Bake pudding until edges are golden and custard is set in center, about 1 hour. Cool pudding slightly, serve warm. Since I felt my bread pudding could do with a little more moisture, I didn’t thicken the sauce to drizzle consistency, rather kept it creamy and poured it in. Also I felt the bread pudding was sweet enough, so didn't add the sugar. Food is a topic of much discussion these days. Umpteen channels on the television talk, discuss, present and even produce insane competitions;all on food. There are millions of blogs and websites all over the internet bursting with tantalizing food and bulging with information. There are hundreds of opinions churned out every day about what food is good and bad for you. There are umpteen lists about "Five Foods to Never Eat" and as many about "Five Foods to ace an interview". You would think "Five" would be an easy number to handle ? Naah. All around me there seems to be a Food bubble. And I do hope earnestly that the bubble does not burst. I am enjoying it. But as much as I love this gastronomical propaganda I must admit I am also highly confused. There is too much information which is hard to assimilate and even trust these days. There is too much of competition about making food faster, prettier, healthier, better and while one day that means oodles of butter, on the other none of it.There are studies being churned out faster than the dollar bill and when it comes to food it is hard to ignore them even in my standard lackadaisical mode. Why my family's health might be affected by the brand new study, that still smells of fresh ink and crisp paper hot from the printer. My child might grow up to be a psycho because she was deprived of Himalayan acai berry juice as a toddler. Local or Organic, Paleo or Vegan, Chinese Study or American, South Beach or Calangute, your garndmother's or mine ? The questions are just too many. And honestly if you notice the core of each of these studies and sum them up it might just be what your Mother had been saying all along and you blindly ignored. Ahhh, what does she know after all. Now grandmothers might be more knowledgeable. 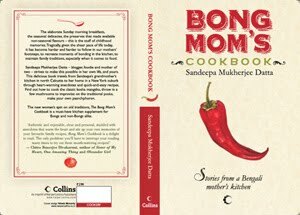 When I was a child growing up in India, food was not a media darling. Few recipes in the Sunday newspaper and a couple of half hearted food pictures in the Bengali magazine was all we had to be satisfied with. Glossy magazines like Femina did not talk about food. News Magazines like India Today stayed far away from recipes and if at all, talked about the dearth of food or the high price of it. "Eat it, all of what is in your plate. Food is precious and there are people who are doing without it" was my Mother's common refrain.Food was revered and recipes were all hand me down or shared with neighbors. My Ma would sometimes cut out of recipes from the Sunday papers and with years they would begin to look like fragile parchment. Food was a mainstay of the middle class household though. 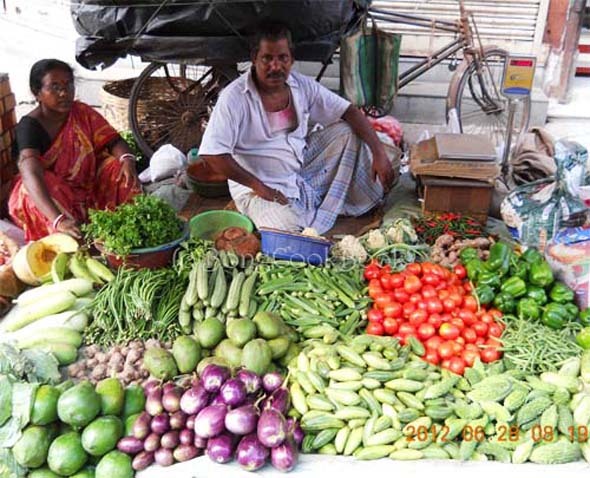 Starting with the morning bazaar routine, getting fresh supplies of seasonal vegetables and fish every day, cooking 3 meals from scratch each day without fail was the norm. 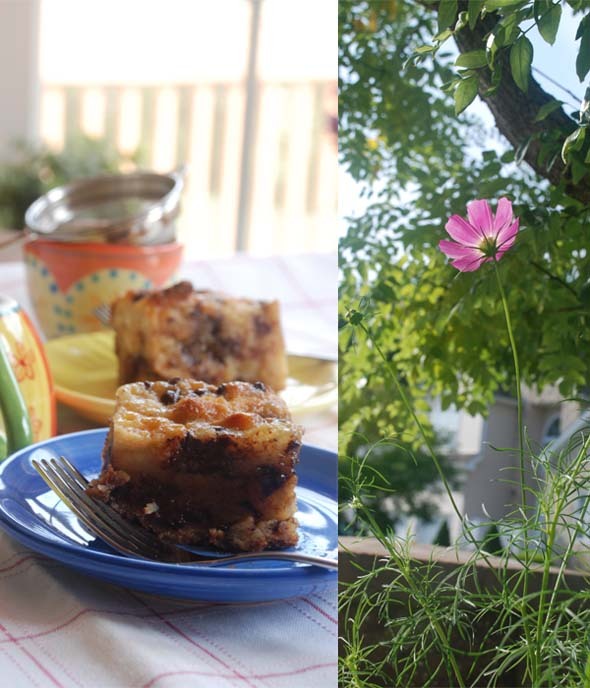 We discussed food with love and passion, as something to be cherished and thankful about. Each time my Thama lamented the milk that the milkman got, comparing it with the creamy, almost reddish hued warm milk from the cows in her parent's home in Munger, we collectively sighed. When my Baba said that nothing tasted as good as his grandmother's ghee parathas and mohonbhog we imagined days dripping with drops of grainy tassar silk ghee. My Ma's cooking usually bordered on the healthy where it was never oily or too spicy for comfort. Yet it was flavorful, always had a vegetable, a fish and grains. The vegetables and fish changed along the season, the dishes varied from light to rich with the temperature. Meat was cooked once a week. I lived my entire childhood yearning for an omlette made with 6 whole eggs which she steadfastly denied spreading the quota over the entire week instead. She or none in her generation stopped to think if it was right to feed this or that. The everyday diet was naturally balanced. All her life my mother's food style remained the same unlike mine which jumps from no-grain in one week to brown rice only in another and raw salad one day to junk food the next. While she lived with maybe three main kinds of grains, my pantry has branded as well as un-branded packs of brown rice, quinoa, daliya, couscous, semolina, flax seeds, wheat germ and other un-inventoried item which I amass because the recent study said so. Needless to say I forget about many of them. I don't know whether her style was correct or whether it worked because the raw food products then were not maligned by harmful chemicals. I am not justifying anything, all I am saying is it was much more easier to think of food and plan a meal then. There were set choices. Now,every week we run around three different grocery stores. For what purpose I do not know. Organic spinach and strawberries from Whole Foods, flax seed from Wegman's, Bitter Gourd and hot green Chiles from Patel Bhai. And then someone comes and says "Local is far better than Organic" and so I again run around, driving 35miles, getting Zucchini from the farm stand which said "Local Produce". In between I have spent an hour debating whether the more expensive wild caught salmon is less contaminated than the farm raised.Thankfully Organic Milk and Eggs is now mainstream and so we can get that anywhere but now they say Milk is not at all necessary for the diet anyway so there my precious 265 hours were wasted. Finally when I am home, drained both physically and financially I decide I need some rest and order a processed cheese artisan pizza from Domino's, glug down a splenda infused coke and try to think of the most edible way to cook the couscous so that I can contribute more food to the world wide web. Of all the "gyaan" that is out there I probably like Michael Pollan's Twelve Commandments best. Minimal processed food. Cook more. Eat at the table. Though I don't follow them strictly, they make sense. But here is where I stumble. "Don't eat anything your grandmother wouldn't recognize as food". Ideally eating what my Grandmother recognized would have been right because I guess that is what my body was suited for but then came globalization and messed it all up. I eat pasta and broccoli in abundance, and I am guessing she would too if she lived with me in the US. Also when I eat some of what she ate like this "Potol" I am actually committing a crime by not eating "local". 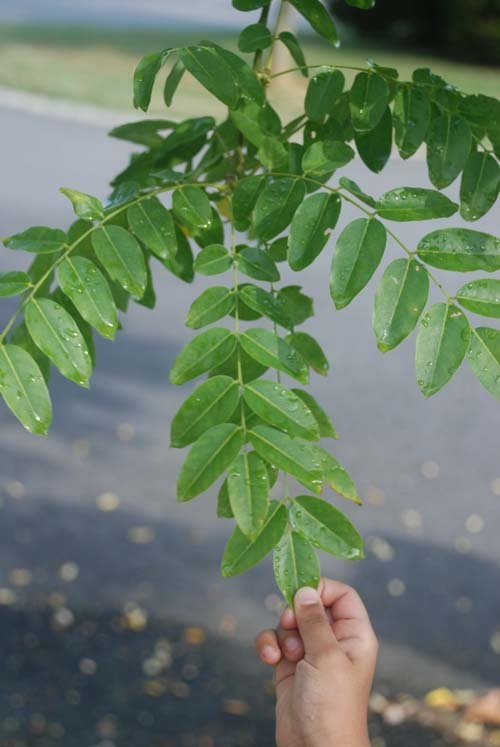 I have no idea where my Patel Brothers get their potol from but I am sure it grows nowhere in my backyard. 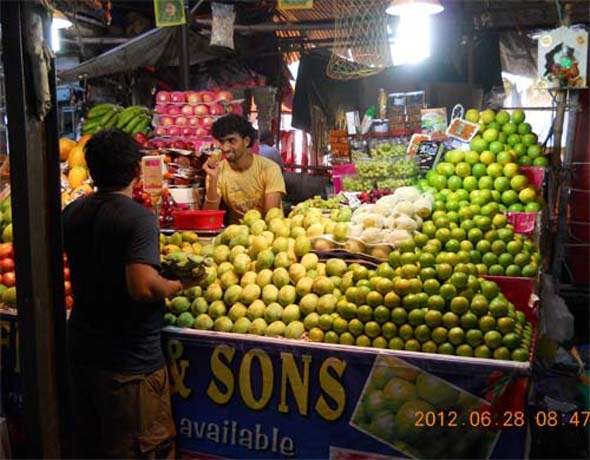 Potol was a vegetable I was never fond of but summer heat brings back memories of patol and grandmothers. I however did not buy potol again, twice in one summer is enough I decided. 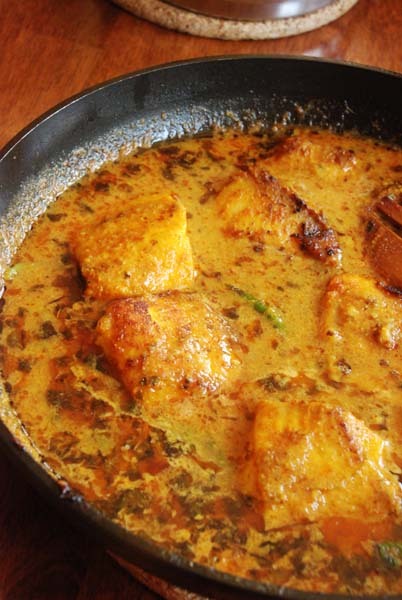 This recipe of Doi Potol -- PointedGourd in a Yogurt sauce is a recipe sent by my Mother. I haven't cooked it yet but the recipe I see is pretty universal and might go well with even eggplants. So that is what I am going to do with this recipe next, cook it with eggplants. You can do the same or if you have access to plentiful potols you can make one more dish with the same boring veggie. Prothome potol take bhajar moto ga ( body ) ta cheche niye ektu haldi & salt lagye bheje nite hobe. Then potol ta tule rekhe in that oil, garam masala & tejpata phoron debe. 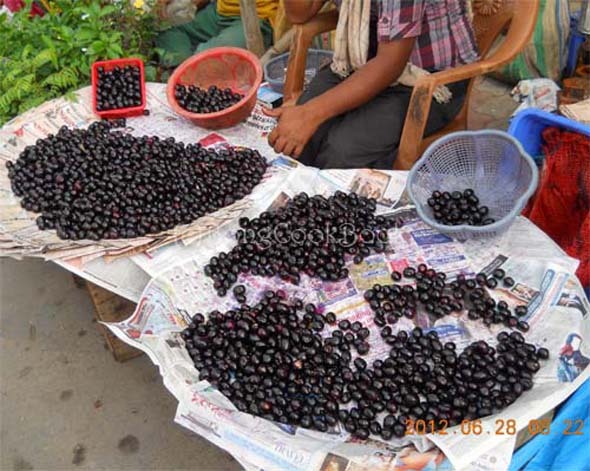 Then ote onion & rosun debe and ginger paste & sugar diye bhjte hobe. Now 1 cup doi ( curd ) haldi, lanka & jeera powder diye bhalo kore phetiye nite hobe. Onion bhaja hole or modhye ei curd diye debe and gas sim kore bhalo kore nere niye ote potol guli diye nara chara kore salt debe. Tarpore jal ( water ) diye dhaka ( lid ) debe. 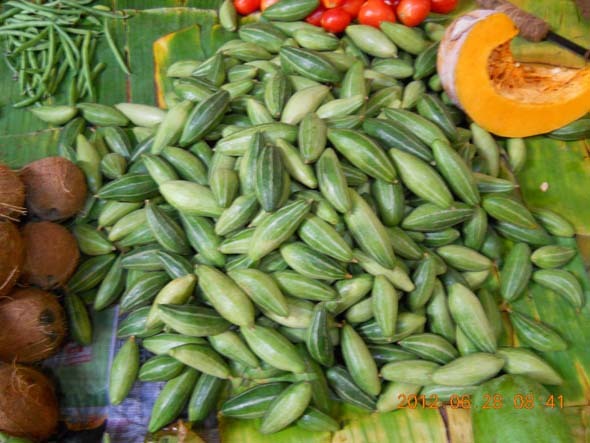 Potol boil hole green chilli long size chire (cut ) ote diye namiye nebe. Scrape skin of potol/parwal and toss in salt and little turmeric powder. Heat Mustard Oil in a Kadhai. Fry the patol lightly, remove and keep aside. Temper the same oil with Whole Garam Masala and TejPatta. Add the finely chopped onion and garlic and saute. Next goes in the ginger paste. fry with a tsp of sugar till onion is soft and browned. Meanwhile in a bowl add the yogurt, Cumin Poder, Chili powder and littel turmeric powder. Beat well. 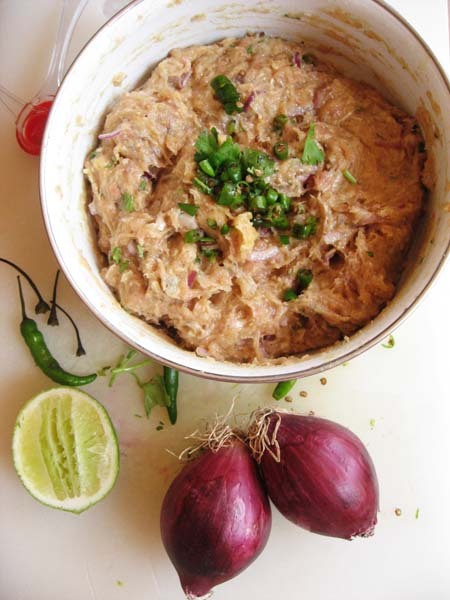 Once the onion is done, take the kadhai off the heat and slowly add the yogurt. 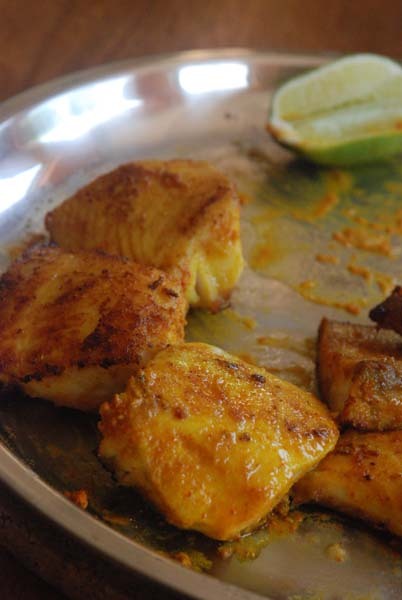 At low heat cook add the fried potol and mix well with yogurt and masala. Add water for gravy, add salt, cover and cook till the potol is done. Once the potol is done add the green chili and switch off heat. This is a recipe from Ahona who had said in a FaceBook comment two months back that she is in love with Methi and suggested her recipe of Sindhi Methi Machchi. That "Methi Fish" remained in the subconscious strata of my brain. Now you might question the existence of "my brain" but we will not go there, we will just dwell on the subconscious where the "Methi Machchi" had sunk deep. More than two months later, one hot, sunny morning in August I went on a quest to find that recipe. From my own FB page. It was a gargantuan task. Yes, "gargantuan". I have wanted to use that word for a while now and have never found the opportunity but this one fits, so we will stick with it. I searched high, low, through the timeline, through other people's vacation pics, through total stranger's family photos but could not find Ahona's recipe. There it was one fine day. Right there as a comment on one of the umpteen status messages I tend to post on my FB blog page. And then Boom, the next thing you know it was lost in the bottomless sink of FB status. That kind of worried me. I mean here I am striving each day, spending precious time, trying to think up smart "Status Updates" and then couple months later ta-da there is no way to find them. My precious pearls of wisdom gone down the drain and without any copyright notice attached to them. The very thought that there is some FB bin where my hard-worked on status is being messed around with someone's dumb updates like "Guess???" is totally freaking me out. Gawd, who ever wrote the code to this thing. Anyway thank my stars that I finally found that recipe of Ahona's. By then it was almost lunch time and I had not moved a finger except on the scroll button. And then I realized that I did not have tomatoes or fresh methi which would have been good, errrm actually required ingredients for the dish. But I am an improvisation master and so I substituted tomatoes with yogurt, fresh green methi gave way to Kasoori methi and then I did a whole lot of other changes.By the time I was done and the house reeked of Kasoori Methi and the fish simmered in the beautiful gravy, I did not dare to call this dish "Sindhi". I have no clue on the "Sindhi"-ness of the dish, the "Methi" part is 100% fulfilled though. 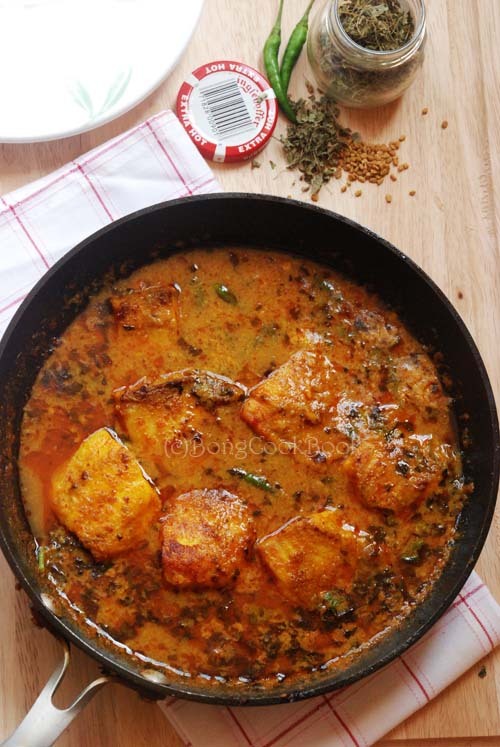 This really is a beautiful dish with newer flavors to the same fish curry and was a hit at my home. Thank you Ahona and I am so glad you shared your recipe with me. I used Tilapia Fillet for this fish. 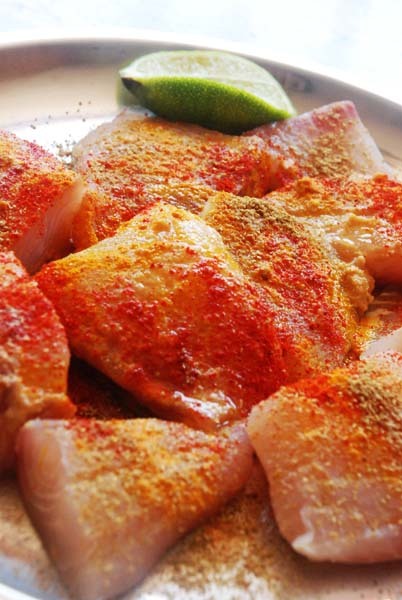 You can use fillet of any other firm fish. 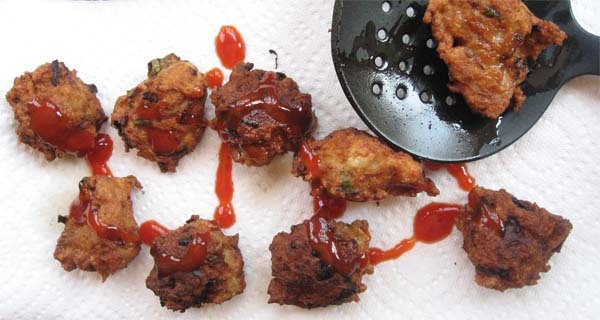 You can also use steak pieces of Rohu or Katla. Pomfret too would be a good choice. Heat 2tsp of Oil in a Fry pan. about 8-10 clove of garlic(6 of the fat ones should be good) till onion is soft and browned. Blend to a thick paste with aid of little water. Next add 2 tbsp oil to the same pan and heat. Shallow fry the fish till they are golden brown on both sides. Remove and keep aside. Now we will make the gravy so if needed add 1tbsp more oil to the same pan. Temper the oil with 1/4 tsp Methi(Fenugreek) Seeds. Also add 1 tbsp loosely packed Maida/AP Flour and fry the paste for couple of minutes. Raise heat to medium and with sprinkle of water fry the masala for 3-4 minutes till there is oil separating from the masala and the masala has no raw smell. Add a fistful of chopped coriander and about a cup of warm water. Add salt to taste. Add couple of slit green chilies. Mix everything together and let the gravy simmer and come to boil. Simmer till you feel the gravy has reached right thickness. It should not be too watery or soupy. Slowly add the fried pieces of fish to the gravy. Let the gravy simmer for couple more minutes and then switch off heat.Wait for around 30-40 minutes for the flavors to blend in. Serve with rice. It was one of those days that deserve some deep fried love. I am not exactly sure what kind of exact day it was but it must have been pretty worthwhile to deserve pakoras being fried in bubbling hot oil. Could have been the day, LS took the plunge and rode the bicycle with the training wheels. From three wheels to four, two of them in training waiting to be taken away. Could also have been another one where she found her knee pads and elbow pads so overwhelming that she refused to ride the bike at all. "I don't want to ride anymore", she decided. Could have been when BS after many, many days of tearful practice of the same piano piece over and over again, found her reward that only hard work can bring. 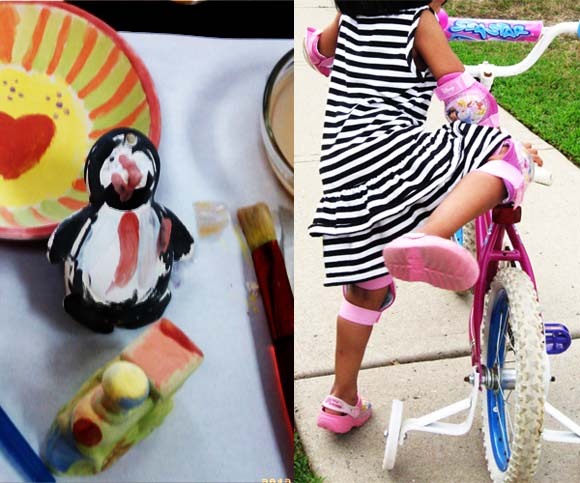 Could have been when I learned of "gentoo penguins" from a smart 6 year old as we painted pottery on a cold day. Could have been the day a flower bloomed. It could have been this day or the other but there must have been something to make me heat a kadhai full of oil to bubbling. 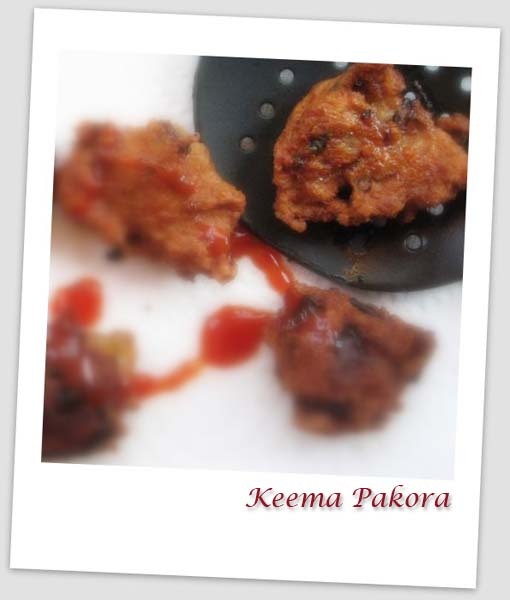 This recipe was adapted from Sanjeev Kapoor's recipe on YouTube. I don't know if there is some divine intervention that I happened to post these keema pakoris on Ramzan when it was indeed adapted from Khana Khazana's Ramzan Special. I have also modified the recipe according to my Chicken Meatball recipe where the breadcrumbs give amazing soft results. This is a simple enough recipe to follow if you have minced meat at home and is a sure fire entertainer. 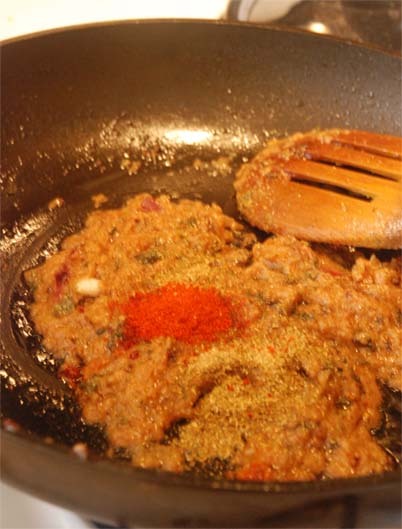 Mix all the ingredients together adding the egg and besan only towards the end. Fashion small balls out of the mix. Heat enough oil for deep frying. Drop the balls in the hot oil. 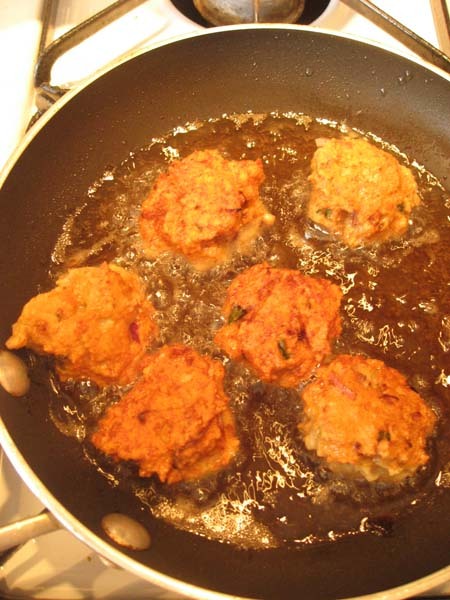 Reduce heat to medium, slowly fry the balls so that the keema cooks. When both sides have turned golden brown, raise the heat and fry for a minute till it turns crispy. Take out with a slotted spoon and drain the oil on a paper towel. 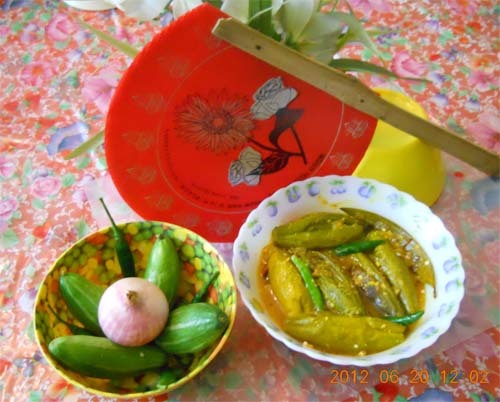 Serve hot with some spicy chutney. Your way to celebrate a fast or a feast.